I read Cindy Sheehan’s sad, bitter letter of resignation from her de-facto position as the face of the American anti-war movement and felt led to mail Cindy this letter from Vietnam. Thank you so much for the energy, devotion and imagination that you have devoted to the cause of Peace. Your efforts have been magnificent. I am so very sorry that they were not more effective in changing the direction of the American government. I, too, have lost hope for America. I worked hard in the days leading up to the 2004 Presidential election and was absolutely floored when King George was re-elected. I know that the election results may have been tampered with in some localities, but the fact that something even approaching 50% of the American electorate chose to re-elect him staggered me! With a public that brainwashed and a “free press” that deeply enmeshed in the brainwashing process, how is any positive change possible? Even so, my hopes were re-kindled when the Democrats won control of both houses of Congress and we seemed to have some savvy leaders in charge. What a disappointment! This system is so distorted that it is impervious to meaningful change. And I agree with you about the divisiveness of the Left. When I read “liberal” responses to Rabbi Michael Lerner’s call for a new, compassionate approach to counter the politics of fear that Bush and Cheney endorse, I am horrified at how tone-deaf and self-righteous his agenda-driven “left-wing” critics are. How can we possibly build a consensus when good-hearted people who reach out to us all are attacked from both the Left and the Right? I left America and moved to Vietnam! There were quite a few intermediary steps—a short-term volunteer trip to Vietnam; establishing my own non-profit organization (Steady Footsteps, Inc.); deciding to quit my job and sell my house and then—taking the money and heading to Vietnam to live and to do charitable work where people still suffer from the results of a previous American adventure, but where life is now peaceful enough that a middle-aged American woman can live securely and do meaningful work. You have done so much good work and endured so much negative crap! Can you imagine a life where you could use the positive contacts that you have to do meaningful work in an atmosphere of appreciation? Consider this: the cost of living comfortably in a peaceful third world country is very low, compared to America. Likewise, the cost of making meaningful changes to poor people’s lives is very low, by American standards. The trick is to actually live in the poor country, rather than travelling to it now and again and relying on quick visits to figure out how best to help people. I am not rich by American standards at all. I am living and operating my modest charity on the proceeds of selling my American house. You might not be so fortunate as to own a house free and clear, but I’ll bet that you have the potential for generating a decent advance by committing to writing a book. Consider taking that sum and starting a new life and a new humanitarian organization outside of the US. It doesn’t have to be a huge operation at all. My own organization consists of me and my husband and the young woman that I’ve hired as a translator. I volunteer as a physical therapy clinical instructor at a rehabilitation hospital in Da Nang three mornings a week. The remainder of my time is free for reading and writing and working on other projects that interest me (like getting all the health care workers in Da Nang to wear motorbike helmets when they travel in town). I don’t cook and I don’t do much shopping. My life is far more relaxed than it ever was in the US—and much, much cheaper! I keep in touch with the world and with my friends via high-speed internet—whenever I’m in the mood. Again, thank you so much for all you have tried to do for America—and for the people of Iraq. You have been an inspiration to me and to many others. But consider, now, an alternate life. Consider leaving the US, not because you despair, but because you can find a new way of leading a meaning-filled and peaceful life. My husband Dave and I returned from breakfast this morning to find a large envelope from the Vietnam Office of the World Bank on the doorstep of our Da Nang townhouse. 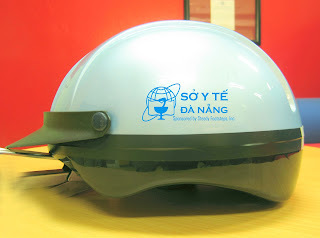 In English, atop the single enclosed page were the words: "Innovation Day, Traffic Safety," so we know that this message refers to the grant application we submitted a month ago requesting assistance in covering part of the expense of providing motorbike helmets for each of the 3079 employees of the Da Nang Health Department. However, the text of the message is entirely in Vietnamese. Dave and I can identify some words: "I", "we", "very", and dates—but the bulk of the message is a mystery to us. Dave is attacking it now with the aid of his pocket Vietnamese-English dictionary and I am sitting across the room, writing and reflecting on how we arrived at a situation in which we have committed to a twenty-three thousand dollar project on behalf of Steady Footsteps, an organization that is, at the moment, without funds. This episode is consistent with what Dave and I have been doing for the past year and a half: Stepping Out on Faith. In 2005, we took a big step in deciding to quit our jobs, sell our home and move to Vietnam. Committing to the legal process and expense of setting up our non-profit organization, Steady Footsteps, was another big step. And yet every day, here in Vietnam, I find myself taking small steps on faith. Each day I arrive to volunteer at the Da Nang Rehabilitation-Sanatorium Hospital without a specific agenda. Every time I insert myself into a specific situation there and open my mouth to speak, I consciously try to center myself and be a channel for truth and for blessing. That might sound pretentious, but it's true. This was not the way I was living back in America. But here, I can be my own best self. Not so much by intention but, rather, by following incremental leadings-- step by step--I've developed a lifestyle which allows me to live a better centered and more conscious life than I ever did in the US. Life in Vietnam, for me, is less stressful than was my previous American existence. I no longer have a house to maintain. I don't cook and I rarely shop. I don't even drive. My commute to work is one mile each way, seated on the back of my translator's motorbike. There's a lot to be said for simplicity. A less cluttered life allows me more time for reflection; for reading and writing. And I find that when my own life is not so pre-programmed and anxiety-driven, that it's easier to pay attention to, and act upon, feelings of empathy and generosity. I work limited hours at the rehabilitation center. I set this up intentionally as I want to be a mentor for the Vietnamese physical therapists and physical therapy students, but I don't want to assume primary responsibility for the care of their patients. I want the therapists to learn to be better clinicians; I don't want them to abandon their patients to my care. Another result of this more limited schedule at the hospital, however, is that my work never becomes routine. I am able to observe and respond to situations there with a fresh perspective. I am not scheduled by supervisors, nor am I responsible for revenues or documentation at the hospital. I can move about and interact with whatever therapist, student, patient or family member seems to need my help. This, more than anything else, I believe, allows me to be in the right place at the right time. I can't speak casually with any of the hospital staff or patients as none of them is fluent in English and my command of Vietnamese is not remotely equal to the task of communicating what I know about the art of physical therapy. I must rely on my translator. I have to carefully consider how my words might be interpreted and there are long pauses in any discussion to allow for the translation process. These pauses and this awareness of the tenuousness of verbal communication give me a lot of time and opportunity to "Be Here Now." I have much more opportunity and incentive to study people's body language and facial expressions. 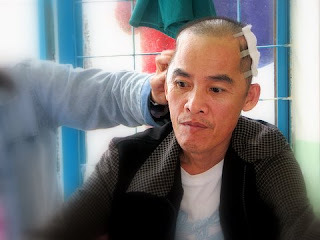 I have been amazed, for example, at how easy it is for me, even as an English speaker, to recognize when a brain-injured Vietnamese patient has receptive aphasia (difficulty understanding his own language). I can even distinguish between someone who has dysarthria (difficulty producing the sounds of speech) vs. expressive aphasia (difficulty recalling words). And yet what seems obvious to me, as an experienced therapist, is not at all apparent to the minimally experienced PT's with whom I work. It occurred to me yesterday that the essence of what I want to teach is not in any physical therapy curriculum. I didn't even articulate it very clearly when I wrote the original mission statement for Steady Footsteps. Here's what crystallized that realization for me. Yesterday morning, I walked into the physical therapy gym and saw a young man with a deformed skull strapped down on a high, narrow treatment table. His therapist, a tall, handsome young fellow named Lam, was vigorously and repeatedly flexing his patient's leg. The patient's face was twisted with pain; the therapist was staring off into space. "Hey," I said, "do you realize you're hurting your patient?" "Well, I told him to tell me if it hurt him. He didn't say anything," responded Lam. "Well, no, he doesn't talk much," admitted Lam. "So how is he supposed to tell you that you are hurting him? I don't speak Vietnamese, but I can look at his face and see pain there. How can you know what is going on if you are not even looking at him? You are trying to increase his range of motion. In order for you to effectively stretch his tight muscles, he must relax. He cannot relax if he is in pain. Watch his face as you work with him and you will learn how to help him without causing him pain." I felt that I had made my point and went on my way. Later, however, I returned to find the patient, again strapped down on the table, looking more distressed than ever. This time, his therapist was looking directly at him and laughing. "What are you doing?" I asked. "You know that this brain-damaged young man does not understand why you are doing these things to him. He is feeling discomfort and yet you look at him and laugh! What can he be thinking? Does he think that you care about him and that you are trying to help him? I don't think so. When he is strapped down on that table he feels helpless and frightened and, to be honest, I don't think that performing passive range of motion is the best use of your limited time with him. Let's try something else." With that, we helped the young man off the table and sat him down on a straight-backed wooden chair. I pulled up another chair directly in front of him. Lam and Mieng, my translator, stood to one side. Looking directly into the young patient's eyes, I smiled and held his hand gently. He smiled back. I helped him arrange his unruly feet flat on the floor. And then I pantomimed that I wanted him to stand up. Counting loudly to three in Vietnamese, "MOT, HAI, BA!" I helped him rise to his feet. I held him there and helped him shift his weight so that it was more directly over his relatively strong left leg. After about 30 seconds, we sat down. Each time we stood up, he seemed to "get it" a little more and make a more effective effort to arise and find his own balance. And each time I smiled at him and praised him profusely. It didn't matter that I was prattling on in English—he understood that I cared about him and that I was pleased with his efforts and, by the time we had completed our session, he was beaming broadly. So what were the lessons of the day? "Being Present in the Moment." "Compassion." Traditional concerns in both my own Quaker faith as well as in my husband's chosen path of Buddhism. You won't find them listed in any physical therapy curriculum, but what other lesson could be more essential for a therapist—or for any other human being? Addendum: Dave's translated enough of the World Bank letter for us to realize that we are out of the running for the grant money that we had hoped would help cover the twenty-three thousand dollar cost of the Da Nang Health Department Motorbike Helmet Project. Oh well. We still feel led to complete this project. We still believe that this project has the potential to help stem the epidemic of traumatic head injuries that is sweeping across Vietnam. So we will, again, "Step Out on Faith" and order those helmets from the ProTec factory in Hanoi. We would like to invite anyone who feels led to do so, to please contribute to Steady Footsteps, in order to not only help us finance this specific project, but also our other, more modest ones: providing plastic ankle braces (AFOs) and other assistive devices for disabled patients and providing the services of a reliable translator for any therapist who is willing to come and volunteer with us here in Da Nang. And if you should happen to know of any compassionate, functionally-oriented physical or occupational therapist with a ready ability to "think outside the box" and a special affinity for upper extremity rehabilitation of brain-injured and quadriplegic patients, please suggest that they contact me at valockett@gmail.com I would welcome their insight and, should they be adventurous enough to visit Vietnam, I'd be glad to help them arrange a meaning-filled visit with the rehabilitation community of Da Nang.